Churros are piped choux pastry- deep-fried to a golden brown, peppered with cinnamon sugar and dipped into luscious chocolate sauce…so, so yummy! 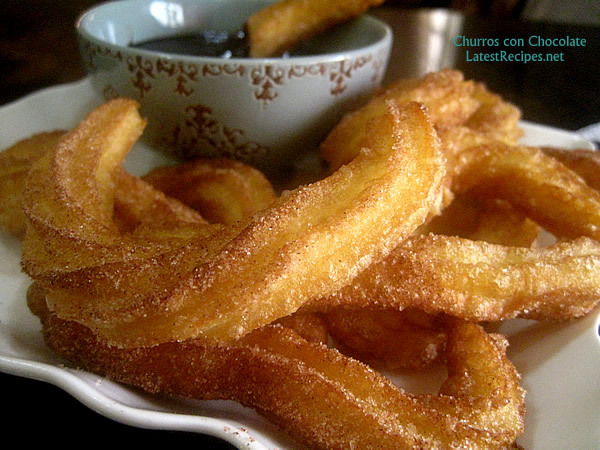 Have you tried making churros at home? This is my first time and I must say, I’m quite surprise at how easy it was to make and way more delicious than what I’ve had before. I think because the oil is fresh in the first place plus the chocolate sauce is thicker and more chocolatey. But I’m not done with deep-fried sweets yet, bomboloni (Italian doughnut) is next on my list..I have to make use of that oil one more time before I discard it 🙂 I should blame those foodies who posts mouthwatering photos on facebook or maybe I should unsubscribed from them eh?! lol Just kidding, I love food! so addictive and so easy to make..
..when you first add the egg, it’ll look like this and feels slimy, it seems that it will not come together but just continue mixing it with a wooden spoon until you get a consistency like a mashed potato, when you add the next egg, the same thing happens..
then serve with chocolate sauce..delicious!! Churros are piped choux pastry- deep-fried to a golden brown, peppered with cinnamon sugar and dipped into luscious chocolate sauce…so, so yummy! In a small saucepan, combine the water (or milk), butter and salt and bring to a boil; lower heat then add the flour and whisk to combine using a wooden spoon. Cook the dough until it pulls away from the sides of the pan about 3 to 4 minutes. Remove from heat, and beat eggs one at a time into mixture, stirring until smooth after each addition. Put the batter in a pastry bag fitted with a large star tip. Set aside while you make the sauce and prepare the cinnamon sugar. Combine the chocolate, heavy cream, butter in a heavy-bottomed pan. Heat, over medium low fire stirring occasionally, until the chocolate is melted and all the ingredients are well combined. Transfer chocolate sauce to a small bowl. In a large saucepan heat the oil to 325 degrees F.
Pipe the dough into the hot oil in sticks or desired shapes. Fry the dough until it is brown and crispy on all sides, 60 to 90 seconds total, turning as they brown. Fry in batches. Remove the churros from the oil, blot on paper towels for a second and then toss in the cinnamon sugar. Be sure to do this while the churros are still hot. Serve immediately, while churros and melted chocolate are warm. One Response to "Churros con Chocolate"
Oh perfect! Churros is SUCH a lovely treat….